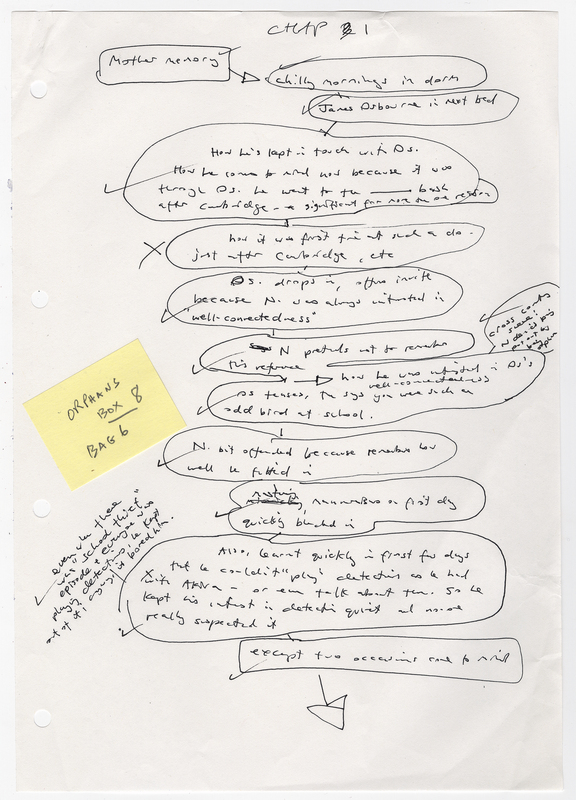 As Kazuo Ishiguro was preparing his archive for transfer to the Harry Ransom Center, he spent weeks sifting through the papers, making notes about the manuscripts and other documents he found in it. 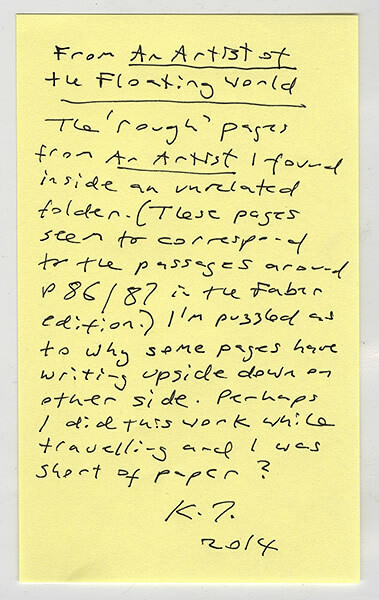 Some of his notes run to a page or more, while others are scribbled on post-it notes and are scattered throughout the archive. Combined they provide a rich and deeply personal commentary on the writing life of one of our finest contemporary novelists. 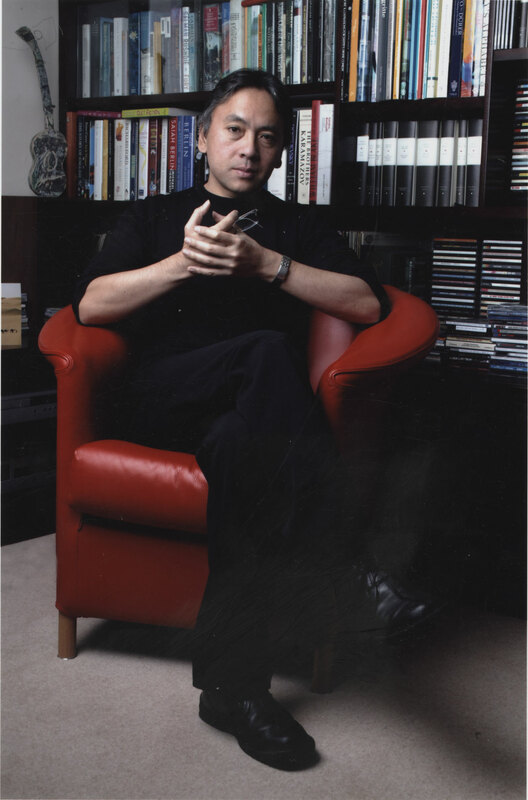 A rare photo of Kazuo Ishiguro not wearing his eyeglasses at his home in London, 2009. Photo by Isabelle Boccon-Gibod. 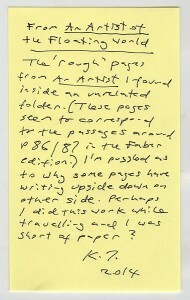 Kazuo Ishiguro’s explanatory comments for the “rough” pages for An Artist of the Floating World. The teenage Ishiguro wanted to be a songwriter, and the first song he ever wrote, “Shingles,” survives among his papers as a reminder of this youthful ambition. “Will your eyes never re-open upon the shore where you once lived and played,” it begins, announcing a persistent theme in the future novelist’s mature work. Other early attempts at song writing appear on the back of oceanographic data charts, which his father discarded. 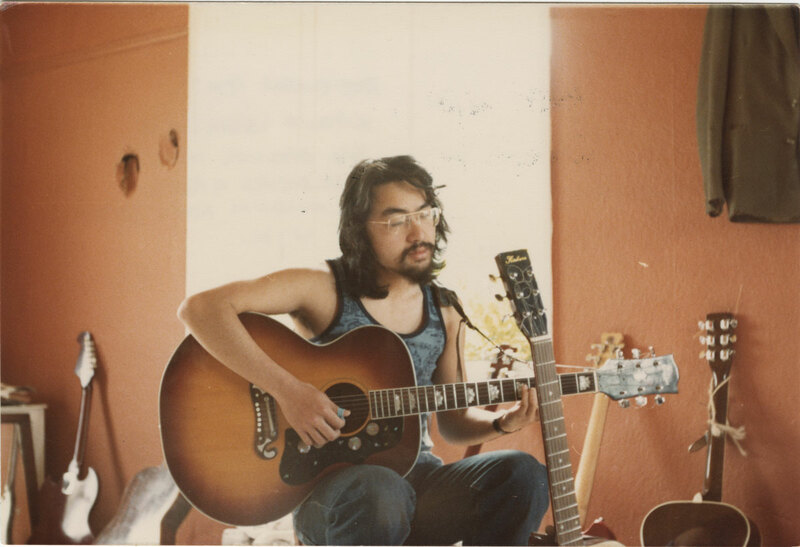 Ishiguro as singer-songwriter in his early twenties, Broadoak, Kent, 1977. Ishiguro still plays guitar-and a number of other instruments-and composed lyrics for jazz singer Stacey Kent in 2007. When he was 19, Ishiguro taught himself to type using a typing manual, High-Powered Typewriter Drills, present in the archive. “My parents had bought me the Olivetti Portable, on which I wrote my university essays as well as all my early attempts at fiction.” Later he would use this same machine to type his first two published novels, A Pale View of Hills and An Artist of the Floating World. Ishiguro’s first serious attempt at fiction was a “pulp Western” written the following year. For a long time he thought all drafts of the novel had been lost. 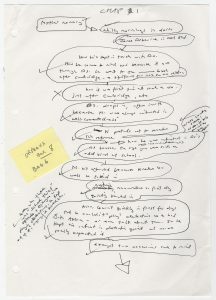 Only as he was going through his papers in preparation for their shipment to Austin did he rediscover the hand-written draft of his first attempt at long fiction. 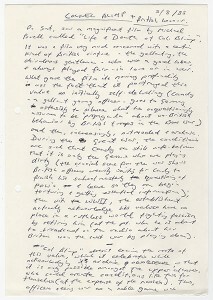 Kazuo Ishiguro’s Dream Techniques page for The Unconsoled. While a student at Kent Ishiguro also kept a diary that records his “gradual acceptance that I would fail in the music world, and the movement of my ambitions towards literary projects.” It was the only time in his life he has kept a diary. A script for the radio play Potatoes and Lovers opened a new direction for him. 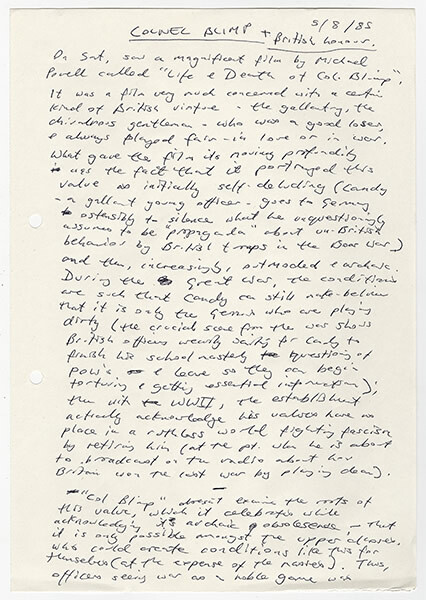 “I submitted it unsuccessfully to BBC Radio, but then sent it the following spring (1979) to Malcolm Bradbury when applying for his (then little known and little respected) Creative Writing M.A. at University of East Anglia (UEA). It was because of this play that he accepted me on the course,” he recalls. 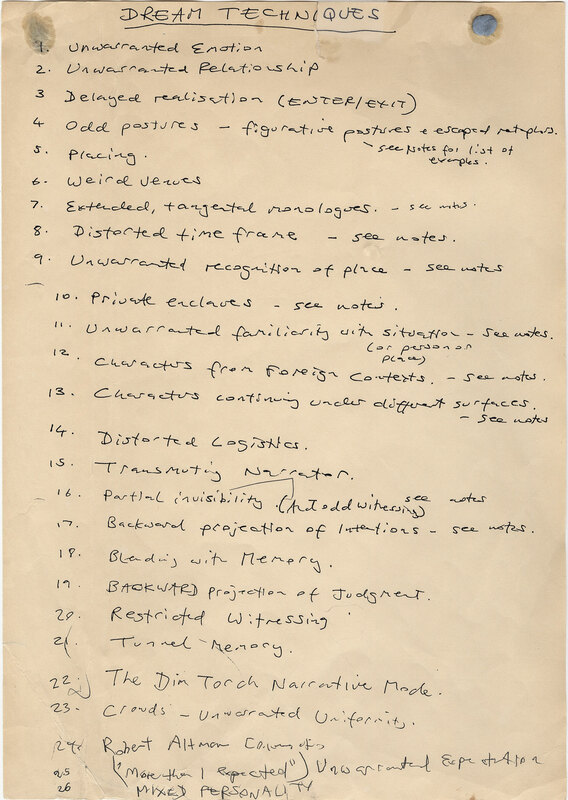 Kazuo Ishiguro’s chapter 1 plan for When We Were Orphans. 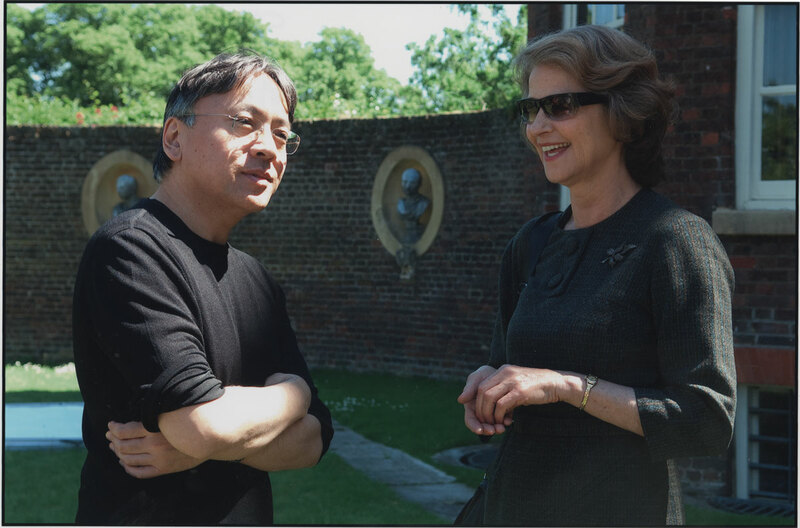 On set at Ham House with English actress Charlotte Rampling, who played Miss Emily in the film adaptation of Ishiguro’s novel Never Let Me Go, June 2009. Ham House has been used in many period films and its exterior was used to portray the novel’s Hailsham Boarding School. A 1984 television drama A Profile of Arthur J. Mason, also bears a direct relationship to the later novel. “This was my first outing with a butler character,” he writes, “and later, as I began work on Remains, I remember I saw in my mind for Stevens the face and manner of Bernard Hepton, the actor who portrayed Arthur Mason.” A film proposal for an unproduced drama, Service in Japan, recounts the experiences of an English butler who travels to occupied Japan with his employer only to find himself impersonating his lordship in delicate negotiations of global significance. In the end, after recognizing the possibilities of the plot, he thought better of submitting it to Channel 4 and began incorporating many of these elements into the new novel. All archives are negotiations with the past, but rarely does one dramatize so fully the play of memory and its intimate ties to the novelist’s art. This story originally appeared in the Spring 2016 Ransom Edition. See the issue at http://en.calameo.com/read/00464396824b619b7a80f.